Mei-Shun sometimes ask Shin to give a request for her piano. When he chooses “flashy one”, it means Debussy’s Arabesque. “Moonlight” is either the one by Debussy or the other by Beethoven. Any pieces need a good finger exercise to play clearly. Today’s lesson was given at night. Mei-Shun has to be careful not to make Master Mei-Shu feel too tired. She often complains about her physical burden to go to Tokushima once a month. Since Master Mei-Shu is our chairwoman of the board of directors while the best dancer, it is her duty to instruct our directors. Such beautiful green peas! Mei-Shun boiled them in sincere accordance with grower’s instruction. He told us to keep the peas in hot water until it gets colder. So, they have no wrinkle on the face. Let’s enjoy their baby-skin texture and sweetness. 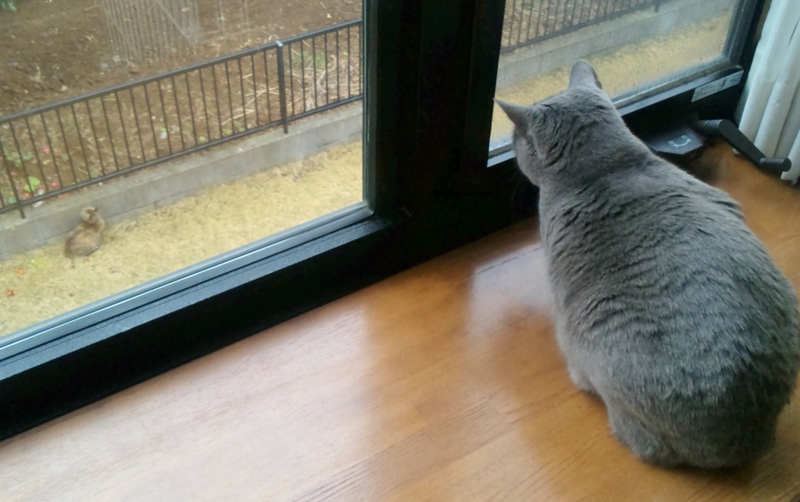 Tora-chan is staring into a bush. And Mikan-chan does onto Tora-chan. Your concentration is amazing – never wander even if mom says hello. They have never met with each other, yet known well maybe. So they’ve come. Yes, cedar pollens. Shin is seriously allergic to them, has only to take medicine and sleep to stop sneezing. And his mother does the same downstairs. Ohhh … Mei-Shun currently has no symptom, yet who knows when and how she joins them? Mei-Shun loves 和菓子=wagashi, Japanese sweets. Anko (sweetened bean paste) is harmonious not only with green tea but also with sugar-free tea and coffee. You can enjoy local excellence of taste at home these days, thanks to frozen ones available on delivery services. Mei-Shun is good at growing green necklaces (only). Today is the “marriage” date for the best-grown one; Professor S, an admirable lady who kindly friends with Mei-Shun, would like that pot. Well, drink much water, relax well in the sunlight, daughters. Who would be the next?